Next, add the remaining ingredients, stir them well, cover the pot and allow the sauce to simmer for at least an hour over low heat. While the sauce simmers, I get to work on the meatballs. In a large bowl, combine all the ingredients. I use my hands to mix it all up--make sure to incorporate all the ingredients very well. Then, begin to form meatballs. You can decide on the size you want/need. I don't make mine very small, but if you want more of them, that's the route to take. At this point you can decide if you want to quickly brown the meatballs in a little butter on the stovetop, or you can do what I do and simply add the meatballs as they are, directly into the sauce. The sauce effectively cooks them and they don't fall apart if you allow them to simmer for a while. 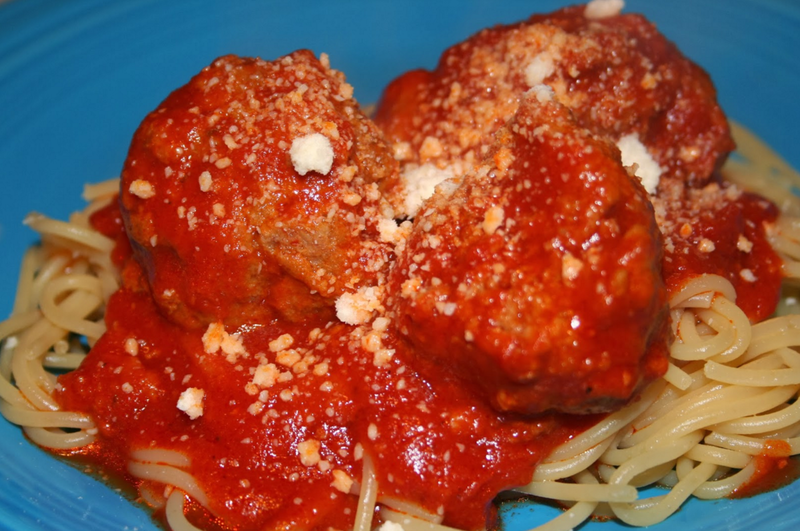 I usually allow the meatballs to simmer in the sauce for at least 90 minutes, if not 2 hours, to make sure that the meatballs are fully cooked through and hot. Go ahead and gently stir the meatballs every so often during this time so that the sauce doesn't stick to the bottom of the pot. All that remains now is for you to cook up the spaghetti noodles when you are ready to serve everything up. I use a ladle to scoop out the sauce and meatballs right onto a plate of pasta. Add Parmesan cheese for a finishing touch and serve with fresh bread and a salad or other green veggie to round out your meal.